As you can see from the breakdown the exam is largely about designing a highly available, cost-efficient, fault tolerant scalable system. The questions in the exam varied from relatively straight forward ones where you just had to know what a solution or service provided to more complex ones where a scenario was portrayed in the question and you had to define which 2-3 answers together enabled them to achieve their requirements. Based on my score I am taking it that the ones that required multiple answers didn’t give partial scores if you got one wrong which is akin to a lot of other IT exams so you certainly have to focus on your answers as I found even with eliminating answers I knew were wrong I was still left with a very close alternative. For the study resources I would recommend watching the vBrownbag series as well as the CBT’s and doing lab work as there were certainly a few things mentioned in there that were directly helpful in the exam. It’s also really great in my opinion to hear about bits from others in the community using the technology. Good luck if you are preparing for the exam, I’m tempted to keep the momentum going and now do the AWS Certified Developer Associate exam. Categories: AWS, Certifications, vBrownbag | Tags: Amazon Web Services, Associate, AWS, cloud, Solutions Architect, study resources, vBrownbag | Permalink. 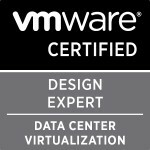 Now that my VCDX defence is over and hopefully I’ve done enough to be awarded an illustrious number I can pick up my old responsibilities for the EMEA vBrownbag of which I am one of the hosts and decided that the VCP6-CMA track would be a great one to do. We are going to be going through the blueprint in order so that it is easy to follow and watch as well if you are subscribed to the iTunes feed. So starting next week Tuesday at 7pm GMT (Clocks have changed in Europe so this is GMT not BST) we will be doing objective 1 and it is being covered by one of the co-hosts of the vBrownbag, Frank Buechsel. You can register for the series and future vBrownbag EMEA sessions via the following link https://attendee.gotowebinar.com/register/8540909933274906113 and can also subscribe to the vBrownbag YouTube channel. If you are interested in covering an objective on the vBrownbag then please get touch as we are always looking for presenters. Categories: Automation, Certifications, vBrownbag, Virtualisation, VMware, vRA | Tags: cloud, vBrownbag, Virtualisation, virtualization, VMware, vRA, vRealize, vRealize Automation | Permalink. Identify availability options for management components. Availability can achieved within the vCloud architecture in a number of different ways and via differing methods. I’m going to break them up into different categories and i’m not going to cover each one but if you understand the different methods I think when you are reading the vCAT or any other kind of design book you’ll be able to identify them with ease. Redundancy: This is simply creating multiple instances of an important service to ensure that if one or more fail that the solution isn’t impacted by this. There are multiple examples of this but the most simple but one of the most important in my opinion is the creation and usage of multiple vCloud cells to ensure load balancing but more importantly redundancy in the event of a loss of a vCloud cell. You can also cover this further down the stack with Heartbeat in the vSphere layer(even though this has now been made end of life) ,multiple network cards from the physical networking and multiple redundant switches to multiple redundant storage processors. Disaster Recovery/Failover: This is covered in a whole section in the vCAT which goes over methods of utilising products like SRM to configure disaster recovery of the management layer. For conceptual this is more about knowing what is and isn’t possible but also taking the availability requirements of the customer from a business impact analysis where it is deemed the amount of money a customer is willing to lose due to downtime and then equate this to a number of nines. 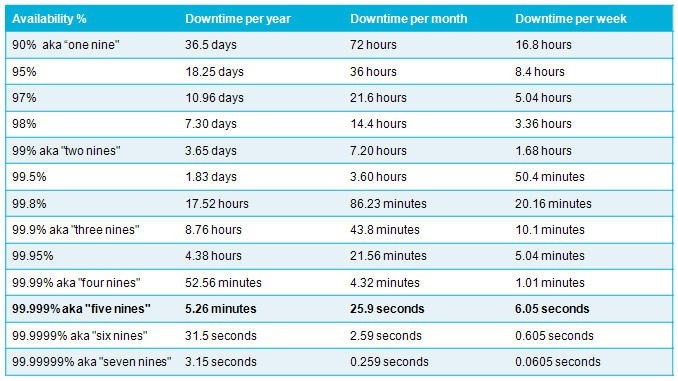 The table below gives an example of the number of times compared to amount of downtime and with the larger the number of nines this will then mean more expensive solutions which you will need to advise your customer about (99.9 can be met by HA for example but 99.99 will require heartbeat and synchronise replication with QoS). For conceptual you don’t cover specific products but knowing that you will need a DR site with fast links between will cover this for example. Differentiate between management components and resource components. This is simply determining what should be part of your management cluster and what should be part of your resource cluster. I think this is really straight forward as anything in your management cluster is used to provide services to you the vCloud administrator and the resource cluster/s are for your customers to provision to and is the pools of resources you configure as your provider virtual datacentres. The below image is a great example of a conceptual diagram of the management and resource clusters. 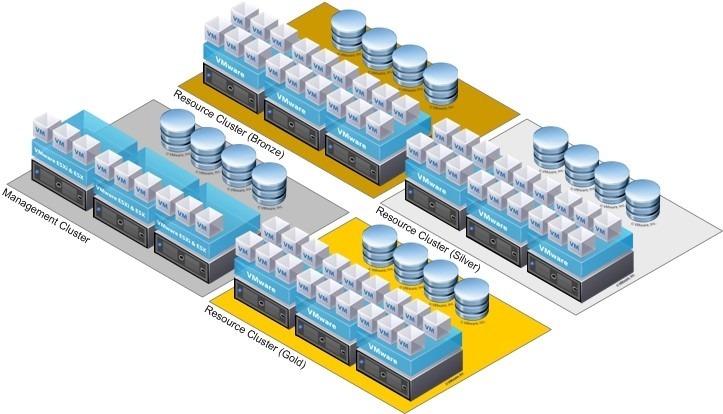 Explain compatibility of various vSphere high availability features with a vCloud design. Given customer requirements and constraints, determine appropriate customer Service Level Agreements (SLAs) for the conceptual design. This is covered in more depth within objective 1.6 so we will cover this in that section. Determine how given SLAs impact availability design decisions. Given customer requirements and constraints, determine how to achieve desired availability. Given customer requirements and VMware technologies, determine availability impact to the conceptual design. I feel this is largely what i have mentioned above but now you are including VMware technologies limitations/capabilities into your thinking which I actually did above. You will need to know what is and isn’t possible with HA for example and how it’s can only provide a certain level of availability and is limited by the amount of restarts it can achieve at once whilst being possibly limited by priority groups. Categories: Certifications, VCAP, vCloud, Virtualisation, VMware | Tags: cloud, conceptual, vCAC, VCAP-CID, vCAT, vCloud, Virtualisation, virtualization, VMware | Permalink. That’s right, after having spoken to the infamous APAC and US vBrownbag teams at VMworld and via the VMware vExpert communities Arjan Timmerman and I have thrown our hats into the ring and have asked to borrow the guys vBrownbag’s and show the world that the EMEA VMware guru’s are the some of the best in the world. We are looking to start doing them within the next few weeks and need all the VMware talent in EMEA to put their hands up and come present and for everyone to join the calls/webinars and contribute. We are looking to possibly follow two different tracks so as to not repeat what the APAC and US guys have done and so will be looking for people to present on objectives in the VCP5-IaaS and VCP5-DT exam blueprints. You can do any of the objectives so if you want to do the last objective for the IaaS then first come first served/booked. We have created a Google form for people to start putting in their interest and what they want to talk about here. Categories: EMEA vBrownbag, General, vBrownbag, Virtualisation | Tags: Certifications, cloud, EUC, IaaS, social media, vBrownbag, VCP5-DT, VCP5-IaaS, VMware | Permalink. Yes I couldn’t think of a better title so I altered my normal title for this weeks proceedings 🙂 . Due to there being so much information coming out of VMworld and certainly a large amount more in the coming week I thought it may be helpful for myself and hopefully others to list all the interesting news and views that are coming out of VMworld each day. Another big announcement is the release of VMware vCloud Director. As to not give wrong information and because I’m only learning about it now myself i won’t attempt to try explain but leave it to the professionals and both Eric Sloof and Duncan Epping have done two brilliant posting all about the release and what the product entails. Duncan’s posting is here and Eric’s here. Next has to be Microsoft’s open letter to customers attending VMworld telling them how Microsoft feels they are more/as capable to provide the best services for people wishing to utilise the cloud in the future. This is a great bit of publicity for VMware in my opinion as it shows how strong Microsoft feels VMware are in the cloud computing arena. The letter is here (*Warning* this is a link that downloads the letter in it’s pdf format). To be fair Microsoft do make a very good point in weighing up the positives and negatives of both sides(as well as other vendors) and it’s great to see they have their own stall at VMworld as everyone wants a fair competition and for the best products to be decided by the users on a level playing ground. Last is the summaries of other VMWorld news by Scott Lowe here,Dan Kusnetzky on ZDNET.com here and a fairly amusing posting by Larry Chiang of “What They Don’t Teach You at Stanford Business School“ fame with his 9 Lies Told at VMworld. Most amusing to me is due to poor layouts of the page it only shows 7 🙂 I purposely left out some things due to them being covered by Scott and Dan as no one likes the same stuff being repeated numerous times. Well that’s my day 0 of VMworld summary. I’m sure I’ve missed a few things but i think I got all the best and important stuff. Categories: Virtualisation | Tags: cloud, ESXi, VMware, VMworld, VMworld 2010, vSpecialists, vSphere, vSphere 4.1 release | Permalink.